Mr Joseph Koh’s home contains a creepy-crawly secret – a collection of 12,000 spider specimens, possibly the largest of its kind in South-east Asia. Meet Singapore’s very own “Spider-Man”. 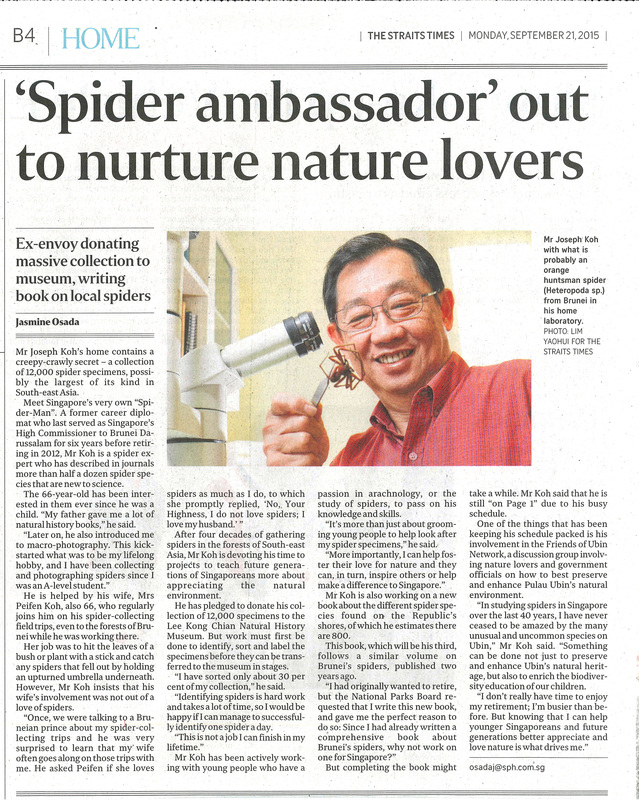 A former career diplomat who last served as Singapore’s High Commissioner to Brunei Darussalam for six years before retiring in 2012, Mr Koh is a spider expert who has described in journals more than half a dozen spider species that are new to science. The 66-year-old has been interested in them ever since he was a child. “My father gave me a lot of natural history books,” he said. He is helped by his wife, Mrs Peifen Koh, also 66, who regularly joins him on his spider-collecting field trips, even to the forests of Brunei while he was working there. Her job was to hit the leaves of a bush or plant with a stick and catch any spiders that fell out by holding an upturned umbrella underneath. However, Mr Koh insists that his wife’s involvement was not out of a love of spiders. After four decades of gathering spiders in the forests of South-east Asia, Mr Koh is devoting his time to projects to teach future generations of Singaporeans more about appreciating the natural environment. 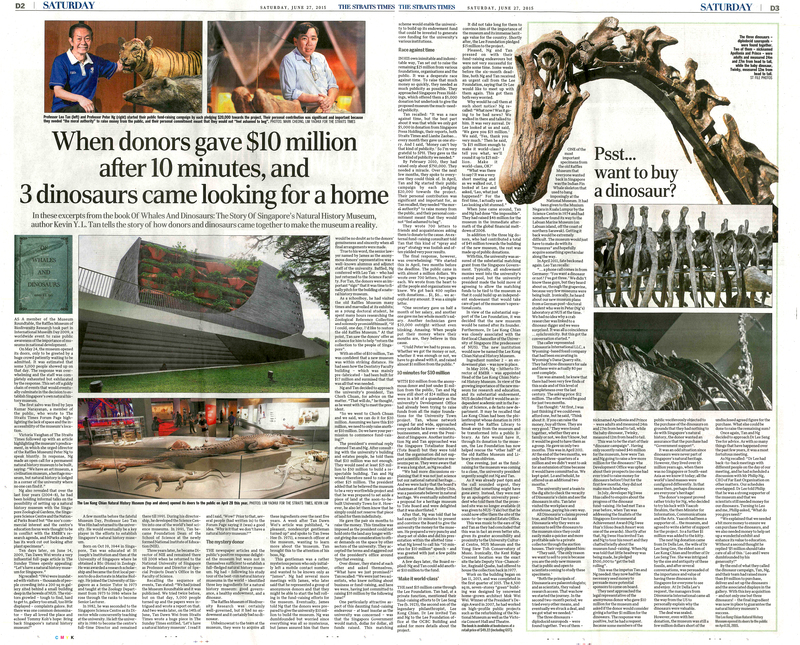 He has pledged to donate his collection of 12,000 specimens to the Lee Kong Chian Natural History Museum. But work must first be done to identify, sort and label the specimens before they can be transferred to the museum in stages. “I have sorted only about 30 per cent of my collection,” he said. “Identifying spiders is hard work and takes a lot of time, so I would be happy if I can manage to successfully identify one spider a day. Mr Koh has been actively working with young people who have a passion in arachnology, or the study of spiders, to pass on his knowledge and skills. “It’s more than just about grooming young people to help look after my spider specimens,” he said. Mr Koh is also working on a new book about the different spider species found on the Republic’s shores, of which he estimates there are 800. This book, which will be his third, follows a similar volume on Brunei’s spiders, published two years ago. But completing the book might take a while. Mr Koh said that he is still “on Page 1” due to his busy schedule. One of the things that has been keeping his schedule packed is his involvement in the Friends of Ubin Network, a discussion group involving nature lovers and government officials on how to best preserve and enhance Pulau Ubin’s natural environment. “In studying spiders in Singapore over the last 40 years, I have never ceased to be amazed by the many unusual and uncommon species on Ubin,” Mr Koh said. “Something can be done not just to preserve and enhance Ubin’s natural heritage, but also to enrich the biodiversity education of our children. 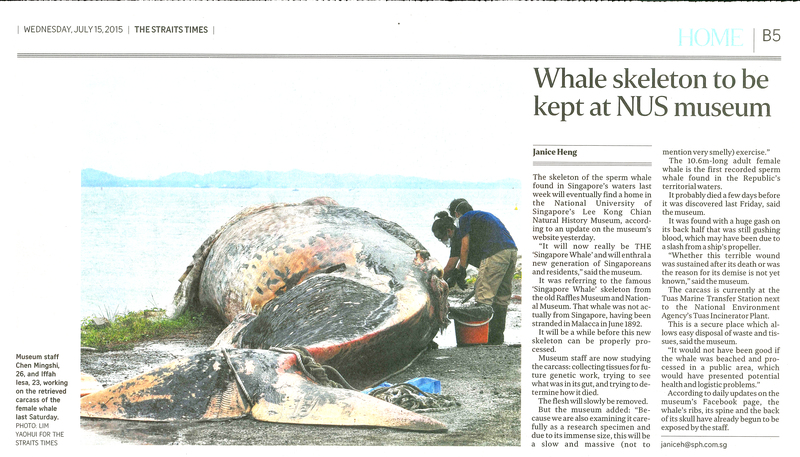 Missed the media coverage of our conservation efforts on the sperm whale? Here is a compilation of the media coverage on the sperm whale so far! Copyright of the articles belong to the respective media outlets.